■ 1Pcs V-Groove Bit: The aptly named bit cuts decorative V-shaped grooves in cabinet doors, drawer faces, table legs, and wall paneling. ■ 1Pcs Core Box Bit: This is a nonpiloted router bit that cuts round-bottomed grooves. It's most often used to rout flutes in columns and vertical stiles. ■ 1Pcs Flush-Trim Bit: If you work with plastic laminate or wood veneer, then get yourself a flush-trim router bit. This straight-cutting bit has a ball-bearing pilot that permits you to trim overhanging surfaces perfectly flush with the substrate. ■ 1Pcs Cove Bit: A cove bit is essentially the opposite of a rounding-over bit. Instead of simply rounding the edge, it cuts a concave radius out of the edge. ■ 1Pcs Roman Ogee Bit: Perhaps the most popular of all edge-shaping bits, Roman ogee router bits have a distinctive profile for cutting classical decorative detailing into the edges of tabletops, picture frames, vertical stiles, and horizontal rails. ■ 4Pcs Straight-Cutting Bit: As its name implies, this bit cuts straight, square-bottomed grooves. Use this bit to cut rabbets, dadoes, and grooves for plywood cabinet backs and drawer bottoms. ■ 2Pcs Rounding-Over Bit: Use this edge-shaping bit on the edges of shelves, tabletops, chair arms, and other places where you'd like to round over a sharp edge. The bit is fitted with a ball-bearing pilot that controls the width of the cut. ■ 1Pcs 45-Degree Chamfer Bit: This edge-shaping router bit cuts a 45-degree angle, called a chamfer, into the edge of a board or panel. It's commonly used to remove square, sharp corners from shelves, picture frames, countertops, and vertical posts. A chamfer bit is also used to create V-shaped grooves between boards. 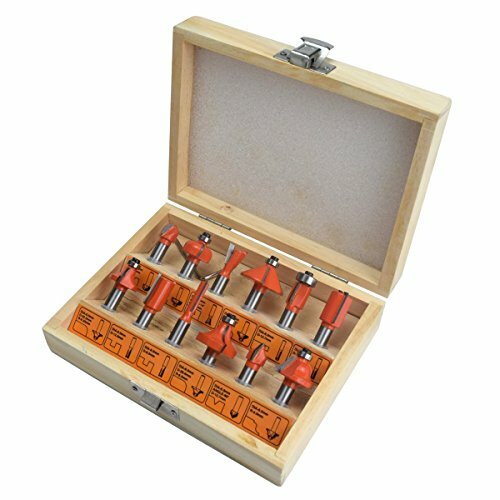 ■ Ideal for the professional woodworker or casual hobbyist, the 12-piece Router bit set includes an assortment of common bits that are widely used in woodworking. ■ Made of durable 45# High-Carbon-Steel and carbide-tipped tungsten carbide tip that stay sharp and are long lasting, perfect for making controlled, safe cuts for your cabinet-making, home restoration or other woodworking project. ■ Precision ground 1/4 in. shanks that fits all 1/4 in. router machines, woodworking trimming, puzzling, boring tenon and carving every type of wood types of wood, it is a great-starter set. ■ 99.9% is not good enough. Backed By the Trusted KSEIBI 100% Customer Satisfaction Guarantee, We will work with you until you are 100% satisfied with every dimension of our service, be it quality, on-time delivery, or response time.